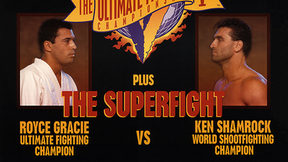 What’s unofficially known as UFC 7.5 stampeded into Denver, Colorado as the Octagon took center-stage for an 8 man tournament featuring some of the best fighters the UFC had to offer like Dan Severn and Oleg Taktarov at Ultimate Ultimate 1995. 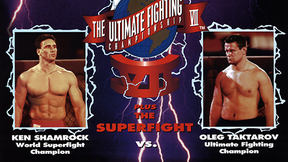 Dan Severn vs. Oleg Taktarov UFC 7.5 Sat, Dec 16, 1995 (34:05) Ultimate Ultimate 1995’s tournament final was, actually, a rematch of a bout from 8 months earlier, Dan “The Beast” Severn tangled with Oleg “The Russian Bear” Taktarov as both had their sights set on being named UFC tournament champ for the 2nd time. 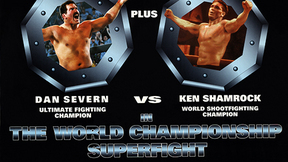 Dan Severn vs. Tank Abbott UFC 7.5 Sat, Dec 16, 1995 (22:09) A real clash of cultures in this semifinals bout, decorated collegiate wrestler Dan “The Beast” Severn took to the cage to meet barroom brawler David “Tank” Abbott. Obviously, Severn wanted to wrestle and Abbott wanted to punch Severn in the mustache. Oleg Taktarov vs. Marco Ruas UFC 7.5 Sat, Dec 16, 1995 (22:27) This semifinals meeting of international jiu-jitsu players and former UFC tournament champions pitted “The King of the Streets” Marco Ruas against “The Russian Bear” Oleg Taktarov, which had all the makings for a grappling classic. 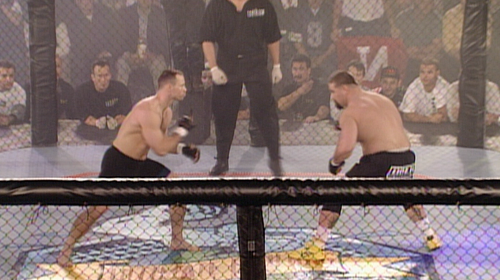 Tank Abbott vs. Steve Jennum UFC 7.5 Sat, Dec 16, 1995 (4:41) There’s no way to kick off an event like a little bit of “Tank”. 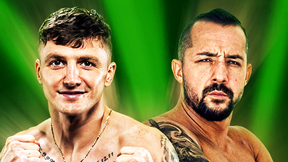 In the opening bout of the quarterfinals, David Abbott with his knockout power and bad attitude was ready to explode on UFC 3 tournament winner and Nebraska policeman Steve Jennum. Dan Severn vs. Paul Varelans UFC 7.5 Sat, Dec 16, 1995 (3:38) Coming off a disappointing loss to be crowned the first UFC Champion, wrestling threat Dan “The Beast” Severn entered the latest tournament with a Herculean task ahead of him with the 6’8” trapfighting Paul Varelans who was a UFC 7 tournament finalist. 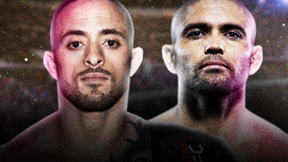 Marco Ruas vs. Keith Hackney UFC 7.5 Sat, Dec 16, 1995 (5:33) Following his tournament win in his first UFC tournament, “The King of the Streets” Marco Ruas aimed to become a back-to-back champion with his first roadblock UFC veteran and Kenpo karate blackbelt Keith Hackney. Oleg Taktarov vs. Dave Beneteau UFC 7.5 Sat, Dec 16, 1995 (3:57) In a rematch of their opening round bout of UFC 6, “The Russian Bear” Oleg Taktarov was ready to put his submission skills to good use for the second time against the heavy hitter from “The Great White North” Dave Beneteau.